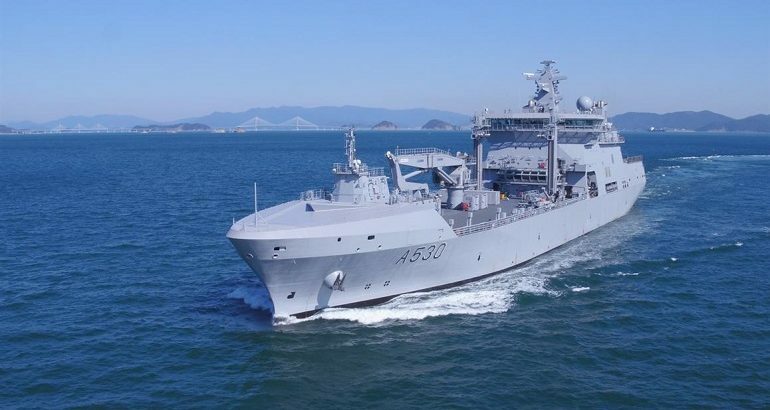 DSME-built logistics support vessel HNoMS Maud started her maiden trip to Norway. 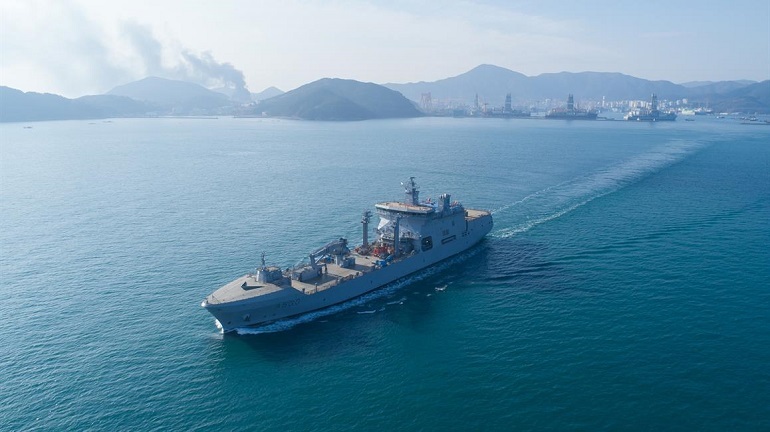 The Royal Norwegian Navy's future logistics support vessel HNoMS Maud departed DSME shipyard in South Korea. The vessel will be fully operational by 2020. Norway’s future flaghip – HNoMS Maud will support surface vessels and subs at sea worldwide. The design is based on BMT’s scalable AEGIR platform and provides global task force support from one multi-role ship. HNoMS Maud was built in South Korea and is a variation of the Royal Navy’s new Tide-class tanker. It will be the largest ship in the Norwegian Navy when it enters service. The Norwegian Navy took delivery of the vessel in a ceremony at the DSME shipyard on 16 November. The vessel is set to arrive in Norway by March following a stop in San Diego, California. In Norway the vessel will be further outfitted with military equipment (weapon and sensor systems). The vessel will be fully operational by 2020. The Norwegian Navy took delivery of the vessel in a ceremony at the DSME shipyard on 16 November. The vessel is set to arrive in Norway by March following a stop in San Diego, California. Norwegian Navy picture. Named after Queen Maud of Norway, this 26,000-tonne logistics and support vessel is the first of its kind in the Royal Norwegian Navy. The fully winterised, bespoke design is based on BMT’s scalable AEGIR platform and provides global task force support from one multi-role ship, featuring helicopter flight deck and hangar, and a 48-bed hospital capability. Designed to comply with international maritime legislation, the Logistic Support Vessel design is a bespoke double hull design adapted from BMT’s AEGIR® logistic support vessel concept, and utilises Commercial Off the Shelf technologies and provides low through life costs to satisfy the requirements common to many of the world’s navies. The primary mission of the vessel is to provide supplies of fuel, ordinances and equipment for marine vessels that are part of the Norwegian Task Group (NorTG) to expand the force’s operational endurance at sea. Secondary tasks will include sovereignty, support for other military units, civilian support, search and rescue (SAR), humanitarian operations and participation in network-based defense. She also carries a 48-bed hospital.